CATONSVILLE – In sending off Gerald “Jerry” Savage, his good friend, Father Christopher J. Whatley offered a trinity of images. None focused on Loyola Blakefield basketball or the Baltimore Catholic League, two institutions elevated by Savage. Father Whatley chose instead to linger on the strength of Savage’s grace, marriage of 51 years and selfless faith. Savage died May 23, six days after his 77th birthday and three months after he suffered a stroke while keeping score at the 44th annual BCL tournament. 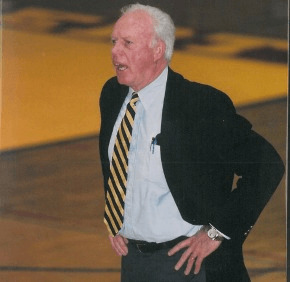 He had served Loyola Blakefield as athletic director and basketball coach, the latter from 1968 to 2003, and was instrumental in the 1971 formation of the BCL. His funeral Mass was offered May 28 at St. Mark in Catonsville, where Father Whatley, the pastor, is a family friend and former colleague, having been on staff at Loyola Blakefield from 1977 to 1986. “Jerry preached, but he didn’t use words,” Father Whatley said in his homily, referencing St. Francis of Assisi’s directive and recalling Savage’s response to the drowning of a Blakefield student, Clarence Braye (‘81), at nearby Patapsco Valley State Park. Savage’s first sporting love was baseball. He coached the JV at Loyola Blakefield, and Father Whatley was his assistant. “Practice or a game would end, and I would walk across the road into (the Jesuit) community and sit down to dinner,” Father Whatley said. “Jerry lined the fields, remained at school until every student had a ride, then drove himself home where dinner was waiting for him. The two raised three sons, Jim, Michael and Kevin. To mark their 50th anniversary in the summer of 2013, Savage and his wife, who taught math at Mount St. Joseph for 23 years, had their wedding vows renewed by Father Whatley, in the chapel at St. Mark. As to the third image of Savage, Father Whatley talked of his solemn approach to his faith, and in particular, the Eucharist. The pews – and altar – were packed with Loyola Blakefield alumni and staff, as well as former rival coaches and players, and Savage’s fellow parishioners from nearby St. Agnes. His funeral Mass – and the evening wakes that preceded it – were all held at the larger St. Mark, with the approval of Father Michael Foppiano, pastor of St. Agnes. He was a concelebrant, along with Monsignor Carl Cummings, pastor emeritus of St. Agnes, and Jesuit Father Frank Moan (Loyola Blakefield ’45), a former administrator at his prep alma mater. The first and second readings, Wisdom 3:1-6, 9 and Romans 8:31-35, 37-39, respectively, were given by fellow Loyola Blakefield mainstays, religion teacher and former basketball coach Pat Maggio, and Joe Brune, Savage’s football counterpart. In remarks before Mass, Jack Degele, commissioner of the BCL, talked of watching Savage play for Mount St. Mary’s University in Emmitsburg when it was a small college power, then having him as an English teacher as a freshman at Mount St. Joseph High School in 1961, and then babysitting his oldest. A eulogy before Mass was given by Savage’s brother, James. The gifts were brought by his five grand-daughters. Pallbearers included former Loyola Blakefield players, such as Morris Cannon, a senior on the inaugural BCL tournament champions in 1972. An IT specialist for the Social Security Administration, graduate of Loyola University Maryland and 2014 BCL Hall of Fame inductee, Cannon was asked which lessons imparted by Savage stuck.